Touch screen light switch combines multiplex functionality with noble elegance. The switch is available in mobile phone glass panel and alloy frame, which is durable and wear-resistant. 2~10 digits of touch number key can be selected for you. Two groups of LED backlight-character are always bright so it is easy to operate at night, there are light chrome, rose gold and other colors for you to choose. We can OEM the language as per request. Single or Two Conjoined Panels, Switches for Option. As our customers are all over the world, each has their language, so we can OEM the language as per request. Use Mobile phone toughened glass panel, wearable and durable. Elegant and Top Grade.Noble and elegant, enhancing hotel new grade. 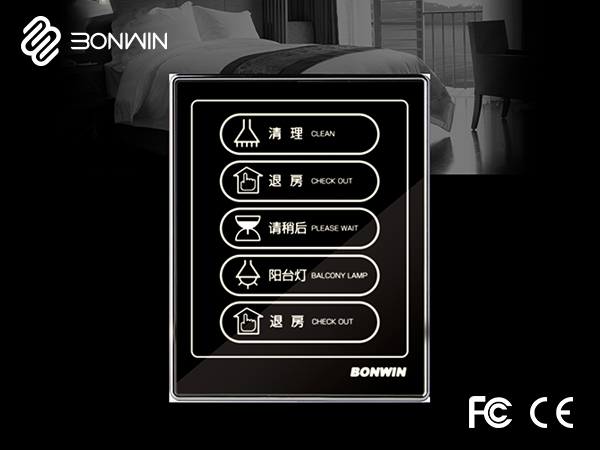 Bonwin's smart hotel touch screen light switch. Capacity touch circuit, made sure the stability. Press button, easy to control lights and air-conditioner etc,. Alloy frame and stainless steel panel, durable and wear-resistant. Mobile phone Toughened glass panel. the safe light will not affect the guests sleep; Press the button, the button outline backlight. 2~10 digits of touch number key. Choose what type according to your customers. Single or Two Conjoined Panels, low voltage touch sensor switch, switches for Option, Dimension: H108×W172×D8mm. Payment: T/T, L/C, western union.